I bought a second hand Salewa climbing helmet... good condition, but later discovered that the sponges/comfort thingies are missing so its not great to wear... So I'm hoping someone else has a similar helmet and could send a pic of the sponsies so I can make a new set and comfortably wear the shell on the next climb. Its a Salewa Toxo, or similar (don't have it at hand to check atm) and hopefully its not a webbing insert but just a few sponges. Hope this helps, not sure if its the right one! Yesss! Thanks Mistrial, That is definitely it! 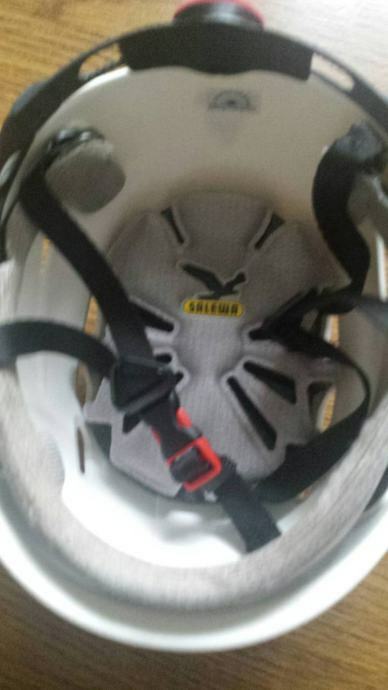 So the next Q is, do you know where in SA Salewa helmets are sold..(where did you buy yours?) Perhaps I could get my hands on an innard. A lot of cycling helmets come with very similar velcro backed sponsies. Maybe pop into a bike shop and ask if they have a few odd ones lying around. The cycling helmets usually come with a second set which gets discarded. Thanks Johan, Thats a good idea.